If you store the VM image-level backup on a backup repository, Veeam Backup & Replication writes archived log backups to the same folder where files of the image-level backup reside. If you store the VM image-level backup on a scale-out backup repository, Veeam Backup & Replication writes archived log backups to the extent where the latest incremental backup file of the VM image-level backup is stored. By default, Veeam Backup & Replication retains archived log backups together with the corresponding image-level backup of the Oracle VM. When Veeam Backup & Replication removes a restore point of the image-level backup from the backup chain, it also removes a chain of archived logs relating to this image-level backup. This method allows you to have both the image-level backup and necessary archived log backups at hand. If you need to recover a database to some state, you can restore the Oracle VM from the necessary restore point and use archived logs to bring the database to the desired state. 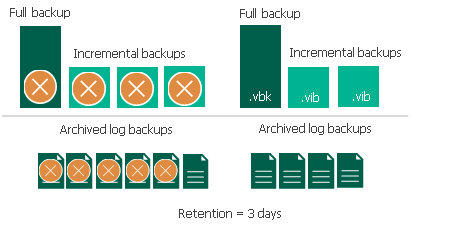 You can instruct Veeam Backup & Replication to keep archived logs only for a specific period of time. This retention setting can be used, for example, if you want to save on storage space and plan to retain archived log backups for the last few days. In this case, you will be able to restore the database only to one of the most recent states. If you select this retention method, you must make sure that retention policies for the image-level backup and archived log backup are consistent. The restore point of the image-level backup must always be preserved. If a backup of the database itself is missing, you will not be able to use archived logs.